Description: London “Punch” caricatured President Lincoln in every possible way, holding him and the Union cause up to the ridicule of the world so far as it could. 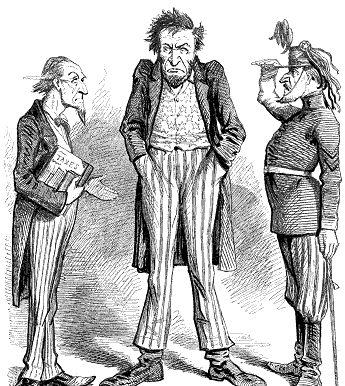 On August 23rd, 1862, its cartoon entitled “Lincoln’s Two Difficulties” had the text underneath: LINCOLN: “What? No money! No men!” “Punch” desired to create the impression that the Washington Government was in a bad way, lacking both money and men for the purpose of putting down the Rebellion; that the United States Treasury was bankrupt, and the people of the North so devoid of patriotism that they would not send men for the army to assist in destroying the Confederacy. The truth is, that when this cartoon was printed the North had five hundred thousand men in the field, and, before the War closed, had provided fully two million and a half troops. The report of the Secretary of the Treasury which showed the financial affairs and situation of the United States up to July, 1862. The receipts of the National Government for the year ending June 30th, 1862, were $10,000,000 in excess of the expenditures, although the War was costing the country $2,000,000 per day; the credit of the United States was good, and business matters were in a satisfactory state. The Navy, by August 23rd, 1862, had received eighteen thousand additional men, and was in fine shape; the people of the North stood ready to supply anything the Government needed, so that, all things taken together, the “Punch” cartoon was not exactly true, as the facts and figures abundantly proved.